The ham at the Italian mountain lodge arrived before we'd seen a menu. Aged in a factory only minutes down the road, it had been smoked over wood like German Schinken. I'd started every meal with ham for more than two weeks-in Umbria and Tuscany, Emilia-Romagna and the Veneto. But this was different. I couldn't get enough. Sauris di Sopra, in the Friulian Alps, has a church, some houses, a few restaurants with accommodation. On this rainy August night, every seat in the Albergo Neider's small dining room was full. Eventually the chef emerged with a recitation. There was spinach spaetzle, Elena Cossuta said, and hand-pulled tagliolini with tomato sauce. She had a breed of beef unique to Friuli-Venezia Giulia, and wild pig served with apple sauce. She'd put cinnamon on the zucchini, baked a Linzer torte and an apple tart. All of it, she assured me, was typical of the region. Typical of the region? It was a history lesson in a bill of fare. This was old Mitteleuropa, a land ruled for centuries by Habsburgs. We were in the path of Napoleonic conquest, occupying a remnant of the Serenissima Republic, yet within the sphere of influence of the Balkans. "Friuli is confined," elaborated Cossuta, who owns the lodge with her husband. "It has been conquered many times by people from other places. The food here, quite naturally, is a mix of those influences." A day later, at his family's Terra e Vini osteria and wine bar in the town of Cormons, within walking distance of the Slovenian border, Andrea Felluga put it in geographic terms. "Friuli is where Western Europe meets Eastern Europe and where Northern Europe meets Southern Europe," he said. "It's a crossroads. The cuisine we eat day after day reflects that." I understood. But it left unanswered the same question that faced me as I'd sat at the Albergo Neider and contemplated dinner. What to drink? 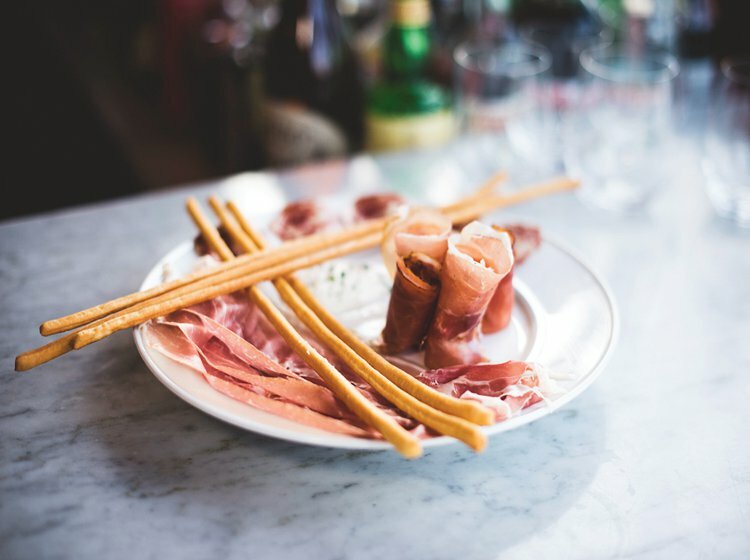 A dish of Friulian cured ham and grissini at Frasca in the Colorado foothills. People are often surprised to learn that Friuli is part of Italy. Many of these people are Friulian. In certain areas, such as the Val Canale and Sauris and the surrounding towns, German is spoken more frequently than Italian. Road signs throughout the region include names in the local dialect. Udine is as near to Budapest as to Rome. Trieste, the capital, has been ruled from Constantinople, Venice, Paris, and Vienna. It is so recent an addition that when it was permanently annexed under the tricolore, Elvis Presley had already started making records. Now that the lira is a historical artifact, the area's allegiance to the national cause is tenuous- especially in years without a World Cup. If Friuli is only vaguely Italian, a lacuna of the Risorgimento, much of Italy itself is the same. "The parts have not added up to a coherent and identifiable whole," wrote David Gilmour in The Pursuit of Italy. Wine drinkers understand. No nation- not France, not Spain, not Australia or the United States, despite their continent-wide plantings-farms a more diverse range of cultivars. Still, Friuli-Venezia Giulia is extreme. "In most of Italy, you have one local red and white wine," the American author Fred Plotkin noted in La Terra Fortunata, his Friulian cookbook. "In Friuli-Venezia Giulia, there is by far the largest range of grapes of any Italian region." And none of them seems particularly Italian. Merlot, not Sangiovese, is the staple red; Friuli was the first Italian region to plant it. Trebbiano and Verdicchio are unseen, but Pignolo has been in the ground since the 1300s. There's Terrano and Franconia, Müller-Thurgau and Pinot Bianco, Ramandolo and Riesling, Ucelut and Cabernet Sauvignon- some 30 varieties in all. And those are just the ones that show up in bottles. Who knows what else is thriving out there on the plains of Pordenone, along the south-facing slopes near Tolmezzo, tucked in a river valley somewhere along the Natisone, the Judrio, the Isonzo? The breathtaking range is a product of the various cultural influences that have left their marks on the region: Venetians carrying Malvasia north from Hellas, Napoleon's troops propagating Sauvignon Blanc and Chardonnay. It's also the result of a terrain that ranges from Alps to the Adriatic over little more than an hour's drive. "We have the mountains, the hills, the plains, the sea," said Marco Fantinel, whose family's winery ranks as the region's largest. "This is the beauty of Friuli. We eat seafood like canestrelli, baby scallops that you can't find anywhere else in the world. And then we go to the mountains and eat wild pig. We have wines that work for one, and wines that work for the other." Sometimes they're the same wine. Fantinel and I were feasting at Ca' Traghetto, an informal seafood house on the coast between Venice and Trieste. We'd tasted three of his wines, including a sparkling Ribolla Gialla made for local consumption that made me despair thinking about settling for standard Prosecco in the future. Now we were alternating sips of a five-year-old Malvasia from Skerk and a three-year-old Vitovska from Kante. These would be obscure hipster bottlings in export markets, hand-sold by a few sommeliers in emerging neighborhoods. Here, they're only a step removed from being poured unceremoniously from a pitcher. They're wines made for local consumption by the same locals who want to consume them. They were ostensibly seafood wines, taut and minerally, but each had an inherent richness. The Vitovska, which seemed to have experienced some maceration, would have worked with my pork and apple sauce at Neider. Fantinel agreed. "Because of the landscape here, even the lighter wines have body and weight," he said. "You can enjoy them with meat-not just pork, but also beef. And then we have red wines-the Schiopettino, the Refosco-that are unique in the world." It was the red wines that surprised me most in Friuli. I'm thinking of two bottles in particular, both made from grapes grown on Italian soil by the singular Slovenian winemaker Ales Kristancic. I drank them at the Michelin-starred restaurant La Subida in Cormons. The first was a 2009 Movia Pinot Noir, though that name is a mistranslation. Because of the vicissitudes of the local dialect, Kristancic explained, this wine should actually be called blue Pinot. It wasn't merely a matter of nomenclature. The difference showed in the bottle. This was a wine that had no interest in being Burgundian, that disdained all connection to grapes of any variety grown elsewhere in the world. One could not compare it to an Echézeaux or a Nuits-St-Georges or even a Willamette Valley Pinot with a straight face. Nor were there flavor cognates to offer signposts. Looking at the wine in my glass, I was tempted to mention blueberries, until I realized that I was being misled by the conversation. The flavor in my mouth had no more in common with blueberries than it did with pumpkin pie. Kristancic was pleased. "Imagine telling a chef, 'I'm tasting your dish and getting mint,'" he said. "And the chef saying, 'Well, I didn't put mint into it; that's not correct.' Don't tell me my wine tastes like other fruits. Have the courage to say it doesn't taste like anything you've ever had." That was certainly the case with his 2003 Veliko, a field blend of Merlot, Cabernet Sauvignon, Pinot Noir, and who knows what suggested I pair with my roasted rabbit, which had been covered in roasted herbs in the Slovenian style. He was right, of course. "People in this region have a knowledge that is second to none of the mysterious ways that flavors in food and wine combine to create something truly extraordinary in your mouth," Plotkin wrote. In this case, the wine itself was mysterious enough. Eleven years old and nearly opaque in the glass, the Veliko had a nervous tension to it that I typically associate with Riesling. I'm not kidding-it tasted like a particularly robust form of Gamay, but there were also elements of Cabernet Franc, and I swear I caught a whiff of Malvasia. As I poured myself a second glass, I started to wonder whether, if I hadn't seen the wine before tasting it, I might have concluded that this full-bodied red was actually a white. In terms of its weight in my mouth, it was lighter than the Vitovska. I had an even more unusual wine later in the week. I set out from Gorizia in search of Trattoria Gostilna Devetak. The GPS kept telling me it was 3.7 miles (6km) away, but finding the restaurant took nearly an hour. After winding through the tiny center of Savogna d'Isonzo, I'd head back out again on another of the roads that led into the countryside. Then, somehow, I'd end up back at the same roundabout. Eventually, I'd been led far enough astray by satellite navigation to make a desperation call. The woman who answered was confident and clear. "If you're at the cemetery, we're exactly 500m [0.3 mile] down the road," she said. "Keep going straight until you see us." But there is more than one cemetery in that part of Friuli, it turned out. I didn't reach the restaurant for another 15 minutes. Possibly because nobody else can ever get there, what I found when I arrived was an oasis of self-sufficiency. Devetak bakes its bread, grows its herbs and vegetables, makes its pasta, churns its ice cream, and stores its wines in a cellar hand-hewn from karst rock. The place exuded a strong feeling of isolation, as though the family had hunkered down for a long winter and never emerged. Once we'd ordered, Avgustin Devetak, the fifth-generation proprietor, chose my wine. It was Benjamin Zidarich's 2011 Prulke, a blend of Sauvignon Blanc, Malvasia, and Vitovska from vineyards near Trieste. He carried it to the table, opened the bottle, poured me a glass, and insisted I drink it at room temperature. Then he stood beside me until I did. I had the Prulke with one of the more original dishes of my trip, or any other: ravioli stuffed with cured herring. If any plate of food epitomized the cultural interaction at play in this corner of the Italian peninsula, this was it. As I ate, visions danced in my head of Hanseatic League traders, of pasta formed and stuffed in the kitchens of Cavour and Garibaldi, of Slavic conquerors charging across the Pannonian plain. "Very typical," my server insisted, but I had my doubts. I consulted Plotkin, and herring is mentioned only once over the 412 pages- soaked in milk, split and boned, covered in olive oil, and served atop polenta: an extraordinary-sounding dish, to be sure, but a different one entirely. The Prulke? It was gold-colored and smelled vaguely nautical. Not especially appealing on its own, it had a strong bitter-citrus component. I wondered first if someone had mixed in grapefruit juice and then, as I continued to drink it, how Zidarich ever sold a single bottle of this wine. But with the ravioli, the wine seemed dramatically different. The curious combination of tastes interacted in the most marvelous way, just as Devetak had predicted they would. I'd order the wine again to eat with the same dish. I'd just serve it colder. Back home, a week of straightforward flavor combinations- Syrahs with roast lamb, and crisp Rieslings with scallops- had me reminiscing about the plot twists of Friulian meals. The post-Boolean logic of eating and drinking in Friuli-Venezia Giulia made choosing complementary wines for the simple dishes I was making seem banal, unworthy of anything beyond rudimentary thought. My hometown happens to have the most accomplished Friulian restaurant in North America, probably the most accomplished anywhere outside Friuli. 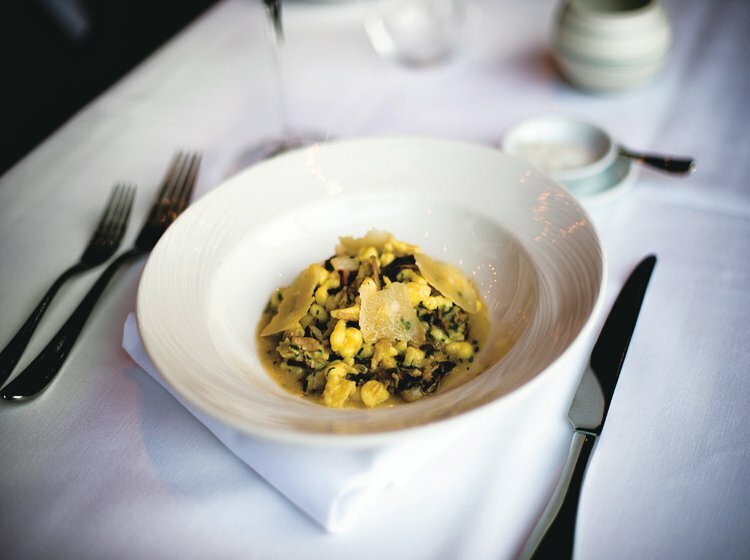 Frasca is an outpost of cured ham, frico cheese, and house Ribolla Gialla in the Colorado foothills. Any chef or restaurateur of ambition in Friuli-Venezia Giulia knows it. Its proprietor, a winery owner and lapsed Master Sommelier named Bobby Stuckey, tours the region annually. The La Subida team visits Boulder to cook at Frasca. The region's top winemakers make pilgrimages. Often they find wines that they're unable to source at home. The last thing I expected to do after a long visit to Friuli was eat an expensive Friulian dinner at Frasca. But I couldn't stay away. "There are two rules of thumb I follow in Friuli," Stuckey said after I'd been paging through the extensive wine list for a while. "First, I always drink Malvasia with raw fish. Also, many of these macerated wines like the Skerk and the Kante are perfect for veal." Useful tips! But what of the pesto-like spaghetti with basil and the roast pork with peaches and spaetzle that were featured on the set menu that evening? I closed the list and asked Stuckey to find me a wine that would accompany me through both. "I can do that," he said. Then he hustled off. He returned with a bottle of Malvasia from Venica, a well-known producer with broad reach in the United States. I couldn't hide my disappointment. Here was a list filled with obscure gems, five wines on every page that I'd have been eager to try, and one of America's premier sommeliers was recommending that I drink a bottle I might come across in the aisles of a well-stocked supermarket. It would be like putting yourself in the hands of the server at London's Locanda Locatelli or New York's Babbo and have them present to you, with great ceremony, a Banfi Brunello di Montalcino. There's nothing wrong with the Venica-or the Banfi. They're tasty wines. But I hardly need expert advice to select them. You can guess how the story ends. The Venica, various vintages of which I'd drunk a dozen times over the past five years, put on the performance of its life. With the spaghetti, it played the role of a Ligurian white, serving as counterpoint to the pesto just as the deceptively simple Bosco- and Vermentinodriven whites of the Cinque Terre typically do. And then, for the second act, a costume change. As the wine warmed, it gained body and heft. Malvasia with roast pork is not a choice I would have made. But when the food arrived, the Venica was doing more than a passable imitation of a Styrian Sauvignon. It was austere yet aromatic, crisp yet powerful, with the acidic bite of a fresh lemonade. Also it felt as dense as a Condrieu on my tongue, a balancing act I'd never experienced. Sipped with a bite of meat and ripe Colorado peach, I never would have guessed it was the same wine I'd been drinking 15 minutes before. Stuckey nodded. He had the look of someone who'd been proven right before. It was a look I'd seen across Friuli from Sauris to Trieste. Culinary concepts that were baffling to me- like ravioli stuffed with herring-make sense if you appreciate the ethnographic underpinnings of their flavors. Inscrutable combinations matched with counterintuitive wine choices can produce a magical result. I'll probably never spend enough time in Friuli to comprehend quite how the magic works, but that's fine. I just want to experience it again.